Like most kids these days, I come from a broken home. My parents divorced when I was young, and by the time I was three, my mom had remarried Michael, my stepdad. From that point on, a majority of my childhood was spent with my mom and Michael, and for a long time, it was just the three of us in our house. Twenty five years later, I can tell you that some things never change. There’s just as many “laugh till we cry” moments and still a handful of cold shoulders and spats. In those years in between, Michael taught me how to ride a bike, how to parallel park, how to balance a checkbook. How to pass a class, how to shoot a basketball, how to break up with a boy. He let me dance on his feet as a toddler and carried me on his shoulders as a little girl, but as an adult, he challenges me to carry myself with confidence and to produce the best with what I’m given. In a time when tumultuous relationships exist within families of all kinds, I’m grateful to have been grafted into a family that has made me a better person. Growing up, our family of three spent a lot of time eating out, and like any normal kid, my favorite part of the meal was always dessert. Luckily, Michael and I shared that love, and 99% of the time, dessert was ordered at our table. Our favorite…debatable. But one dessert that was frequently ordered and I will always associate with Michael is peanut butter pie. That love of peanut butter pie has followed me all of my life. Several years ago, I sat across from a guy on our first official date. After a meal full of conversation and starry eyed looks, he offered to order dessert. Let me be clear- I never turn down dessert. BUT! I was trying to be dainty and ladylike and completely unassuming, so I insisted I was stuffed (ha!) and politely declined. Instead of accepting my unconvincing dismissal, my date ordered me a slice of peanut butter pie to go, and I swear to you that at that moment, I was in love. Five years later and 2 kids later, that date is now my husband and we eat dessert every night. And whenever I get the itch to make peanut butter pie, I think of that first date, the many slices of peanut butter pie that came before it, and how grateful I am that Michael unknowingly taught me to love a man who orders me dessert. 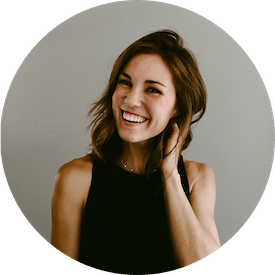 The peanut butter pie I am sharing with you today is not your average Joe. 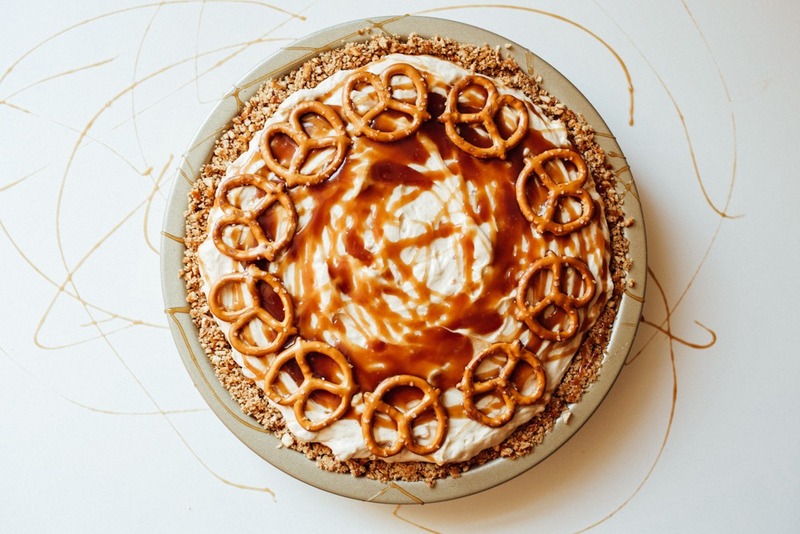 It’s a caramel peanut butter pie with a pretzel crust and it. is. my. jam. If you think you’re the person that can’t bake or doesn’t have pie skills, this is the recipe for you. Your time has come, and you have to make this pie. A buttery and salty pretzel crust, pressed underneath a layer of caramel, creamy peanut butter filling, and finally, pillowy dollops of whipped cream. A few more drizzles of salty caramel and a handful of crushed peanuts later, and you’re pretty much halfway down the highway of my dreams. You want this pie. You need it. And if you don’t have the detailed memories of peanut butter pie like I do, this is definitely the recipe that will give you some. 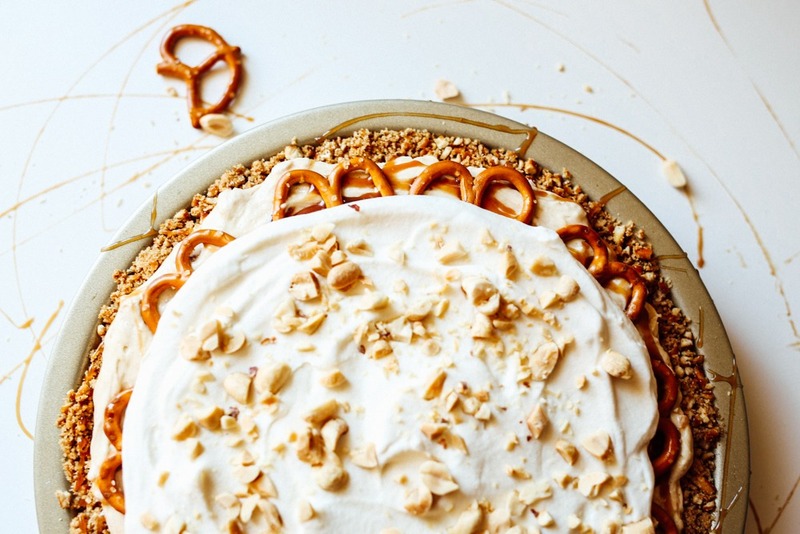 Make this peanut butter pie, eat it all, and then high five yourself for winning on this Monday. Cheers to you! 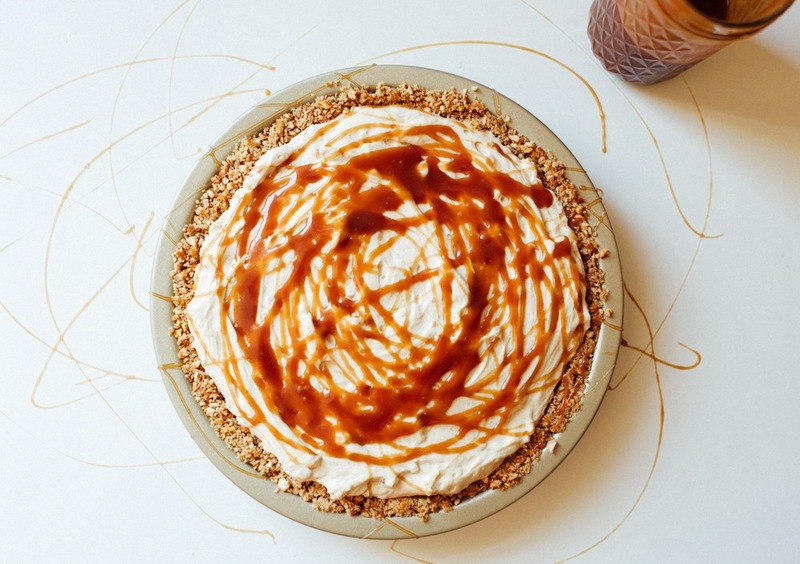 This peanut butter pie features a pretzel crust, drizzles of caramel, and dollops of homemade whipped cream. Enjoy garnished with extra pretzels, peanuts, and drizzles of caramel! 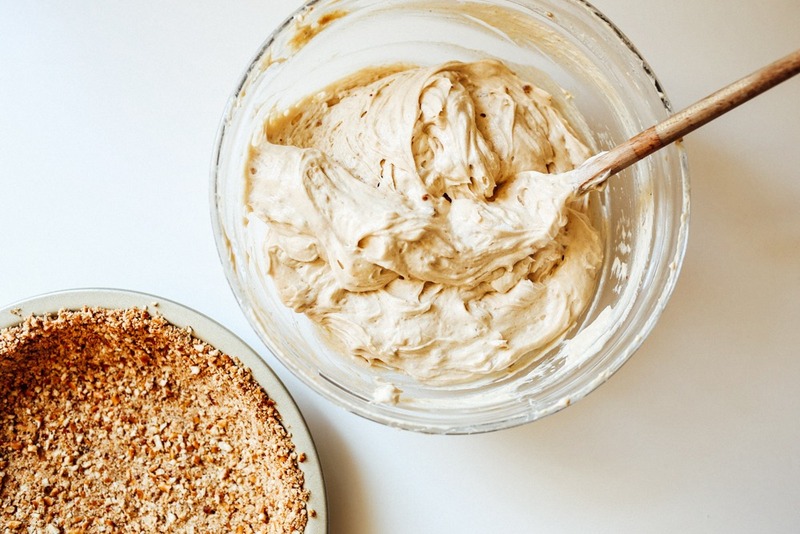 In a food processor, whiz the pretzels, brown sugar, and salt until the pretzels are crumbs. Add the melted butter and pulse to combine. Pat out the crumbs into the bottom and sides of a standard (not deep dish) 9″ pie plate. Bake in the oven for 8-10 minutes until set. Allow to cool completely before using. Whip the cream and sugar together in a medium sized bowl until stiff peaks form. Set aside. In a separate large bowl, beat the cream cheese, peanut butter, and confectioners sugar together until smooth, about 1 minutes. Fold in 2/3 of the whipped cream until smooth. Layer half of the peanut butter mixture into the pie pan. Drizzle with half of the caramel. Layer the second half of the peanut butter mixture on top. Drizzle with remaining caramel and top with the reserved whipped cream. Garnish, if desired, with peanuts and pretzels. Chill in fridge for 2-4 hours until cold before serving. 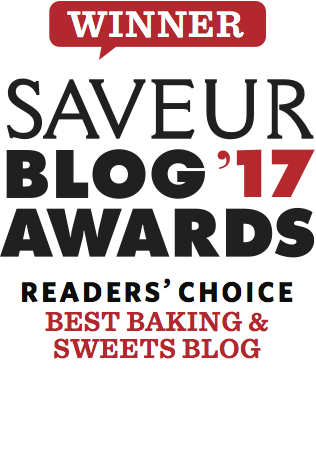 I like Bobby Flay’s recipe for salted caramel (found on NYT.com) but store bought is fine. :))) I think he will like it. loved this! 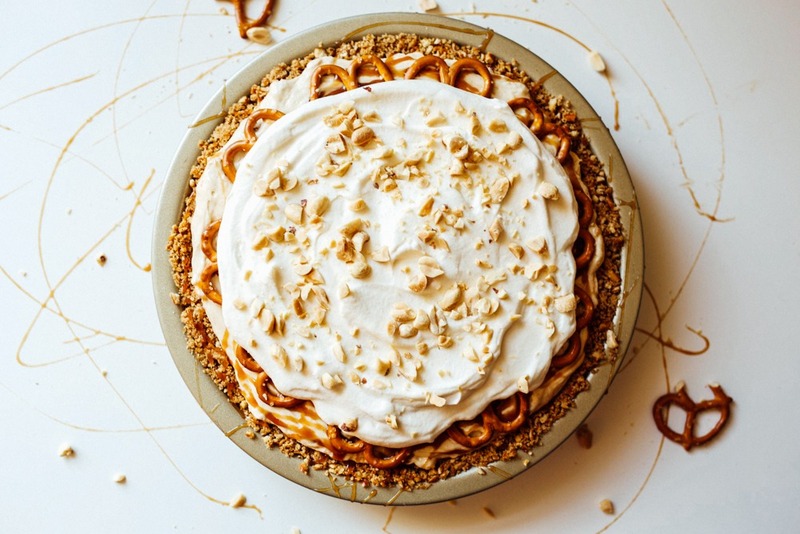 also obsessed with peanut butter pie, I will have to give this one a try! Awesome post Kate! Keep them coming. Thank you, lady! You, the most peanut buttery lady I know, would love this!